Active vulnerabilities can present a serious threat to organizations, which is why many are turning to intelligence solutions to spot and manage security issues. Cloud-based security and compliance specialist Qualys is announcing a new service as part of its Cloud Platform. 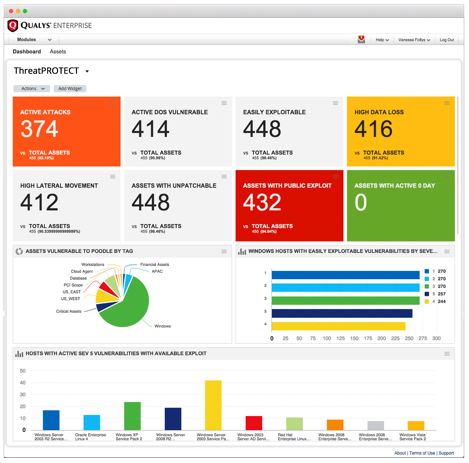 Called Qualys ThreatPROTECT, it provides customers with an interactive dashboard to help them understand security threats at-a-glance. ThreatPROTECT's dashboard uses vulnerability scan data gathered via Qualys scanners or Cloud Agents in real-time and correlates this with Real-time Threat Indicators (RTI) from multiple industry sources. It then provides customers with an easy-to-understand display offering clear insights into what vulnerabilities to fix first based on the level of threat seen in the wild. "In today’s rapidly changing threat landscape, the most effective way for companies to protect themselves is to accurately identify assets, identify vulnerabilities, and ensure that systems are properly configured," says Philippe Courtot, chairman and CEO for Qualys. "Our goal is to continuously expand and improve our cloud-based offerings so customers can raise the bar when securing their assets. Qualys ThreatPROTECT is another example the demonstrates the power and agility of our cloud platform to introduce new services that can help customers improve their overall security without the cost and complexity associated with deploying enterprise software". Qualys is also announcing the extension of its Cloud Agent platform, with the availability of agents for Linux and Mac OS, adding to the platform's existing support for Windows. The Cloud Agent platform gives organizations the ability to conduct real-time asset inventory searches on a global scale, to effectively address the security and compliance of their IT assets. Cloud Agent augments the company's Cloud Platform. It automatically collects vulnerability and configuration data and securely transfers it to the Qualys Cloud Platform, where it is analyzed and correlated to identify risks and eliminate vulnerabilities. Courtot adds, "IT and security professionals have the daunting task of ensuring that all assets are up-to-date, compliant and secure. With the availability of the Cloud Agent on all major computing environments, companies can now inventory all their IT assets, get the visibility needed to secure them against cyber attacks on a continuous basis and take action with Qualys' new patching capabilities". More information on these developments can be found on the Qualys website and they'll be on display at the company's RSA stand.